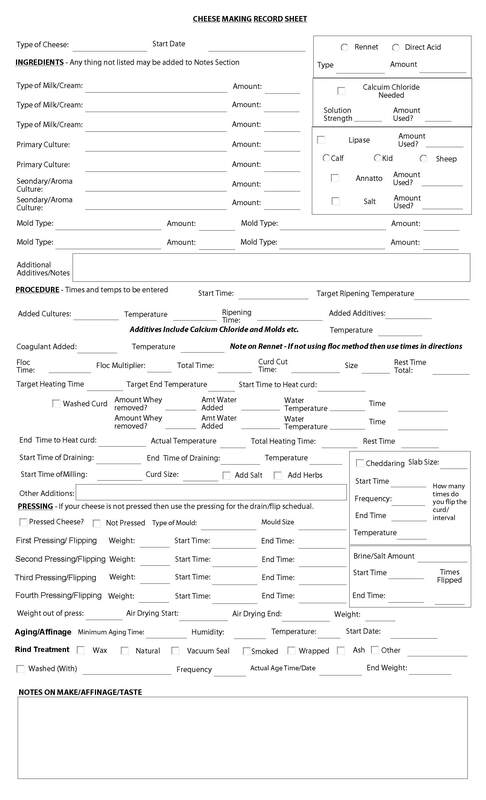 I posted an update earlier for the sheet that I use when I make my cheese. Again after using it I noticed another error when using Acrobat 9, so here is Version 2.0. I hope this will be the last time I have to update this form. It still does not have spaces for pH, but they can be put in the notes section. You do need Acrobat Reader for the form, and if you want to use it on an iPad, then you should get the “PDF Forms” app from the app store. It was worth the money. Here it is if you would like to use it. If you have suggestions please let me know. ← Cheesepalooza – A year in Cheese Making Begins 1 August 2012! not to be disrespectful or anything having never communicated yet but just read over the form and there was a typo at the top where “calcium” needs to be corrected. Thanks, I appreciate it. I will have it fixed sometime this week.